As coalition crumbles, Jewish Home head says he wants to defense minister to stop deterrence from continuing to erode. 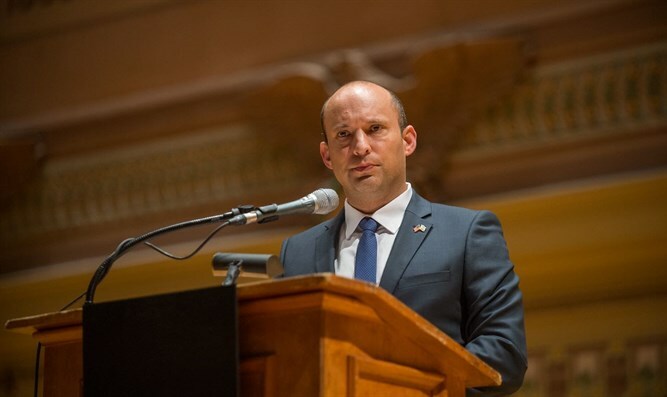 Jewish Home leader Naftali Bennett said that he wants to succeed Avigdor Liberman as defense minister in order to revamp Israel's security establishment. Following Liberman's resignation, Bennett has told Prime Minister Netanyahu that his Jewish Home faction will leave the coalition if he is not appointed defense minister. Speaking at an Education Ministry conference in Ramat Gan on Thursday, Bennett alleged that Israel's defense establishment suffers from a defeatist attitude and promised to institute a paradigm shift upon becoming defense minister in order to stop Israel's deterrence from eroding. "The most dangerous thing for the State of Israel is that we began to think that there is no solution to terrorism, terrorists, missiles, that there is nothing to do, that there is no way to win," said Bennett. "Yesterday I went to the prime minister to ask him to appoint me defense minister so that Israel will go back to winning" Bennett continued. "Without taking responsibility for security and without dramatic change, Israel's deterrence will continue to erode, Hamas will continue not to be afraid of us." "As defense minister, I intend to bring innovation, creativity and a spirit of fighting, to break a decades-long mental state," contended Bennett. "I am willing to take responsibility." Bennett currently serves as Education Minister and Minister for Diaspora Affairs. The coalition's future appears shaky after both Kiulanu Chairman Moshe Kahlon and Shas head Aryeh Deri called for new elections on Thursday. Jewish Home officials said Wednesday that despite warnings that Liberman’s resignation would likely spell the end of the current government and the 20th Knesset, a narrow coalition could be kept in place into 2019. The Netanyahu government currently holds a 66-seat majority in the 120 member Knesset. With Yisrael Beytenu’s departure, that majority will be reduced to just 61 seats. If the Jewish Home does not receive the Defense Ministry portfolio, however, lawmakers say the party could join Yisrael Beytenu in pushing for new elections.